Replacement Electronic Flasher for the 1969, 1970, 1971, 1972 & 1973 Mercury Cougar with sequential tail lights. When your lights are sequencing too rapidly, causing the outer light to not fully illuminate, your original unit is most likely the culprit. 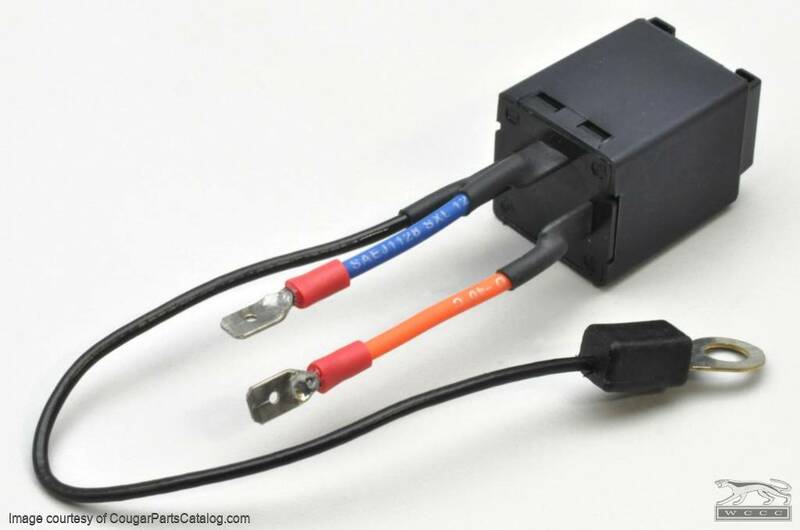 This solid state unit replaces the small red (69-70) or green (71-73) flasher found under the dash, next to the radio. Replaces Ford part # D0WY-13350-A. *NOTE* Need help diagnosing a Cougar turn signal problem? Victor Yarberry is the world’s most knowledgeable expert on the subject. Vic has owned Cougars since the 1970's and is the designer of all of our solid state sequential systems. There is no question he cannot answer! Here is a link to a great source of information on the subject. Works great. My signals were not working at all. Installed this and they work great now. Replaced current part, once I found where it was hiding. Turn signals were operating intermittently. Replaced all parts to get it working. Problem was the switch in the steering column. Restored operation to original specifications. The material, fit and craftsmanship on this item met my expectations. The product came with some helpful instructions on how to locate the old unit and to correctly install the new unit. The old unit was a green round cylinder. The new unit is square, however it was easily replaced and is hidden behind the dash. Very pleased with the performance of the new unit. The timing of the sequential operation is slower.